After watching the recent UFC with several friends (who didn't spill wine this time), I came to the conclusion my brown sofa was getting lonely. Sure it has a rattan to it's left but that's like putting a cat and a dog together... sure they can get along over time but there is an unstated yet understood resentment by the rattan. 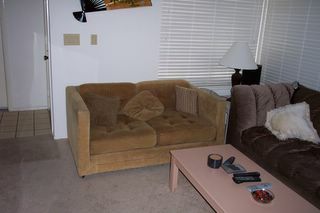 I have been thinking about getting a loveseat (still don't understand why they named it that unless you have to be "in love" to sit that close together) but knew I wasn't going to 1) find one that matches the sofa 2) find money under my pillow to replace both with something new and 3) find something as comfortable as the sofa. So I have had it in my mind to get something for awhile. I've been keeping my eye on the furniture section on Craigslist for one and on Saturday... it pops up. I didn't catch it until Sunday morning and I sent off an email. I find out that 2 other people plan to pick it up and she will sell it to the first one there when she got home from work on Monday at 5:30pm. I told her that I'll be waiting there for her. hahaha And that I did. I took a break from the newsletter, waited there, paid her, put it on my Rodeo by myself and set it up in the house where it is in the picture. Then, I got back to work. Sure it isn't the same color as the other one but it's as soft, fits the earth-tone motif and only cost $25. hahaha Btw, if you look closely you can see my collection of remote controls and a bowl of jellybeans. I usually don't sweat the whole "matching" thing. With the exception of the couch all else is a hand me down. 1980's love seat (almost a plaid in earth tones), a blue lazyboy, and my big brown couch. There are some sweet aspects to being single. The biggest is that no one really expects too much from you in the furniture department. It looks soft, I wanna touch it. Uh ok I prolly could have phrased that better. Even after I got married my living room furniture was hand me downs. When I moved from my last apt, I dumped my bedroom set and took my grandma's old bedroom dressers, they are solid heavy pieces cira 1940s at least. I had hand me downs pretty much all my life. When my mom left to live with her boyfriend, I remodeled the whole house. Well, pretty much. I bought all new furniture, huge mirrors for the wall, and the most I spent was $800 on my son's bed. That was jackass move! Anyhow, I like to match. I guess I got pretty "picky" so to speak. I do however love a bachelor pad. They're too cute. I love my furniture, but I'm a Gemini and get tired of things pretty fast. I'm ready for something new. I need to sell mine. I have had so much success with furniture on craigslist. It's nothing short of amazing the amount of great furniture you can get that way for a cheap price. It sounds and looks comfy. The perfect makeout pad! Loveseat? Hmmmm have you broken it in yet Mart? Long live the jellybeans! After readin this I took stock of my furniture. The only things which aren't handed down or "yard sale" goods are the boys bedroom suit (costs more than all the other furniture combined), my washer/dryer, and my computer. And somehow my home is still too full of crap..lol. I'm with Jenn on this one, bachelor pads are so cute! DG - No, no breaking it in yet. But then again, if I did would you want to know for the next time you sit there? Gotta love the jellybeans. Lily - It's more fun to touch when it's not soft hahaha. Gotta love antiques... love that tv show. Jenn - Damn, $800 on his bed? I'm sure he would have rather had half of that in Nintendo games. Vavoom - I also picked up a TV on there awhile ago. But just gotta look at it pretty good before buying. $100 for a 27" TV that was supposedly 3 years old. The label on the back of the TV says 1997 UL listing. DHOH! Teri - Of course you are still loved. I'm sure I'll get the stain out sometime but it's kinda nice to have something to remember ya by when I'm in the living room. Miss H - Gotta love yard sales. I'm a garage sale whore. Lucky that I work on weekends and most are over by the time I get off work. RT - Nothing is wrong with being picky and matching things. B) I'm just happy to have things that work like they should. Btw, good to see you back. We were worried. LOL! I didn't say anything about the pieces "matching". I find more perfection in the random... If that makes sense.